Central Desktop was founded in 2005, and developed the SocialBridge collaborative platform, which produces online project management software. A privately held company, Central Desktop is headquartered in Pasadena, California. Clients who utilize Central Desktop include CBS, the American Red Cross, Sesame Street, MLB, and WD-40 Company. Central Desktop offers an online collaboration software application that allows users to manage projects, collaborate on files, and connect teams via its SocialBridge collaboration platform in the cloud. Designed specifically to enhance communication for marketers and agencies, along with small and large businesses, SocialBridge team collaboration software allows you to centralize communication while making it easier for team members, as well as contractors, freelancers, clients, vendors, and other external partners, to work and communicate directly with your company. Task creation, meeting scheduling, web conference hosting, and customizable database information sharing are all part of the SocialBridge platform that an entire team or organization can access anytime, anywhere. Summaries of team productivity and engagement on demand allow you to know exactly where projects stand. There are no costly up-front start up expenses, as Central Desktop’s SocialBridge online project management software is available on a monthly pricing plan based on needs and usage. This project management software is used by half a million customers across the globe including many well-known companies such as: CBS, the American Red Cross, Harvard University, the U.S. Department of Health and Human Services, and the defense contractor Vose Technical Systems. Review more of the top Project Management solutions with our Product Selection Tool. 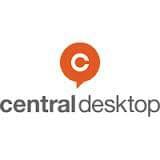 Got questions about Central Desktop? Call, click, or email to speak with an unbiased Technology Advisor for a no-cost, no-obligation consultation on your unique requirements. Learn everything you need to know about Central Desktop. Our experts will reach out to you shortly.